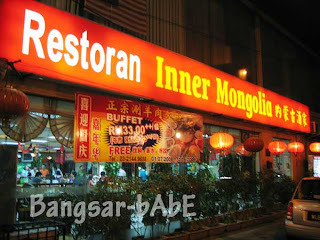 For Roy’s farewell dinner last week, boss (DF) decided to take us to Inner Mongolia, Jalan Pudu. He ordered quite a few dishes for us to try, since he’s quite a regular there. Don’t know how much all the dishes cost, but DF told me it’s reasonable. We started with a series of palate teasers: Salted Egg Pumpkin, Shredded Pork, Mongolia Lai Pei, Pig’s Ear Salad, Mongolian Pancake and Roasted Lamb. The salted egg pumpkin was absolutely divine. 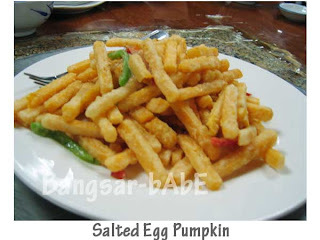 The pumpkin was coated with salted yolk batter and then deep-fried till golden brown. Soft, slightly creamy sweet pumpkin in savoury and slightly pungent salted yolks; the whole ensemble simply melts in your mouth. Deliciously addictive! 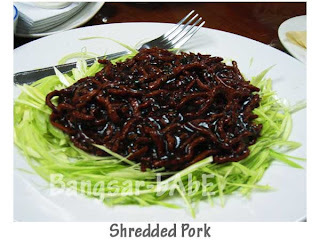 The Shredded Pork looked a lot like our local Hokkien mee. The pork meat was slightly sweetish and sticky. We ate the meat by wrapping it with popiah skin, which was lovely, especially when paired with crunchy shredded cabbage and spring onions. The Mongolian Lai Pei (starch jelly sheet) was merely flat rice noodles tossed in their special sauce. Not sure what exactly they put in the sauce but I tasted peanuts, chili and sesame oil. Tasted weird to me – very much like cold, slimy kuay teow. 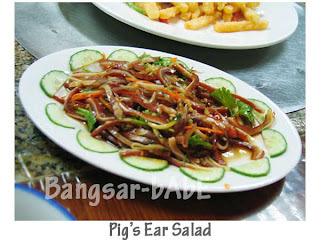 The Pig’s Ear Salad was also too foreign for me to enjoy. I felt a bit ‘geli’ eating pig’s ear. Not something I’d order again, but the others didn’t seem to mind it. 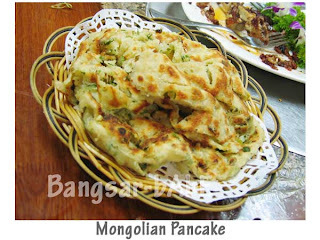 The Mongolian Pancake looked like our local roti canai but more aromatic with plenty of herbs and spices. This bready appetizer was extremely fluffy and light. Very nice indeed. Quote from Roy, “Not nice….it’s DAMN kau nice! 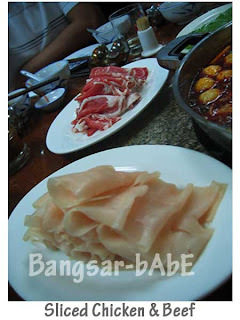 !” DF told us that the Roasted Lamb was good. He was right. 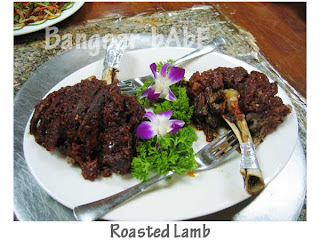 Piquant, fragrant and heavily spiced, the roasted lamb is one of their specialties and I could clearly see why. It was absolutely delicious eaten with the Mongolian Pancake. I liked that it wasn’t gamey, thanks to the strong spices used. 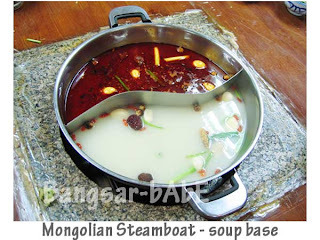 The Mongolian steamboat soup waas served in a ying yang pattern. Both soups share the same soup base. Only difference is, the spicy soup has a thick layer of chili oil on top. 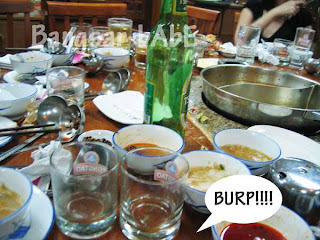 I took one sip of the spicy soup and OMFG!! It was super HOT!!! Too hot for even a chili queen like myself. I turned bright red, and after a few sips, I couldn’t feel my tongue. In the end, I gave up and stuck to good ol’ herbal soup. 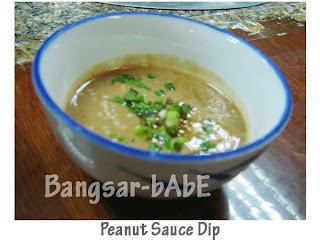 Each of us were given a special peanut sauce for dipping. Almost all of my colleagues didn’t use the sauce, but I loved it! I helped myself to all their sauces. 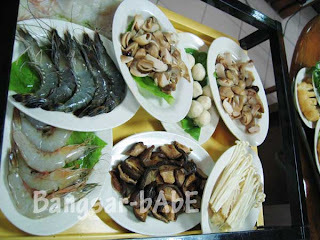 Hehe… The steamboat ingredients were the usual ones found in steamboat restaurants, so I didn’t find them spectacular. 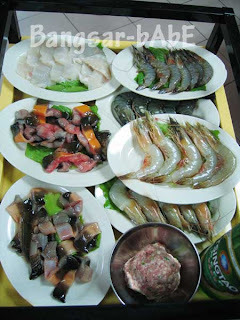 All in, the steamboat didn’t leave an impression on me, but the dishes did…big time! Thanks for dinner boss! Verdict: I enjoyed most of the food, especially the salted egg pumpkin and roast lamb! hmm… salted egg pumpkin looks like chips. very curiosity-inducing. spicy eh? looks like just herbal soup would do!.. Damn kau spicy. If we’re in cold countries then shiok! Otherwise, herbal soup is a safer bet.